Army Steps Up Efforts to Get New Troops Fit : Shots - Health News The Army says it's trying to train new soldiers more like athletes. That means healthier chow, physical training to prevent injuries and an emphasis on endurance. Soldiers can still find pancakes on the chow line at the U.S. Army's Fort Leonard Wood training facility in Missouri. But now they're made with whole-grain batter -- adding more fiber and protein. The new focus on nutrition is part of a 'Fueling the Soldier' initiative that aims to teach soldiers to make healthier choices during military training and in combat. "The Army must treat our soldiers as tactical athletes to improve not only physical training but also trying to get them to adapt the right nutritional aspects to help prepare them for the battlefield and for their life," Lt. Gen. Mark Hertling said in a statement. Hertling is overseeing an overhaul of physical readiness training. In fact, the Army is tossing out the old training manuals, and taking a new approach to basic training. Gone are the long endurance runs, which officials say can lead to injuries in new recruits who aren't accustomed to the mileage. Instead, soldiers will be coached by trainers to do a whole range of exercises that build core strength, flexibility and endurance. Training will be tailored to a soldier's level of fitness. A new cafeteria Fort Leonard Wood was also unveiled today. As soldiers walk down the cafeteria line, they see foods marked with red, yellow or green labels. Green marks high-performance foods, and posters nudge the soldiers to "Go For Green" frequently. In addition, the cooks have turned off fryers and started baking more entrees. They're also adding lots of 'nutrient-dense' menu options made from fresh food. To help reinforce these messages, drill sergeants will give one-hour courses in "performance nutrition." Maybe Shots can invite them over for dinner with our kids? Why the change in approach? Well, army recruits mirror the general population, which is trending toward the 'heavier' side--to put it politely. More than 9 million Americans of prime recruiting age are too heavy to join up, according to Mission: Readiness, a group of retired senior military officials pushing for better fitness for young people. Enlisted men and women are no exception. 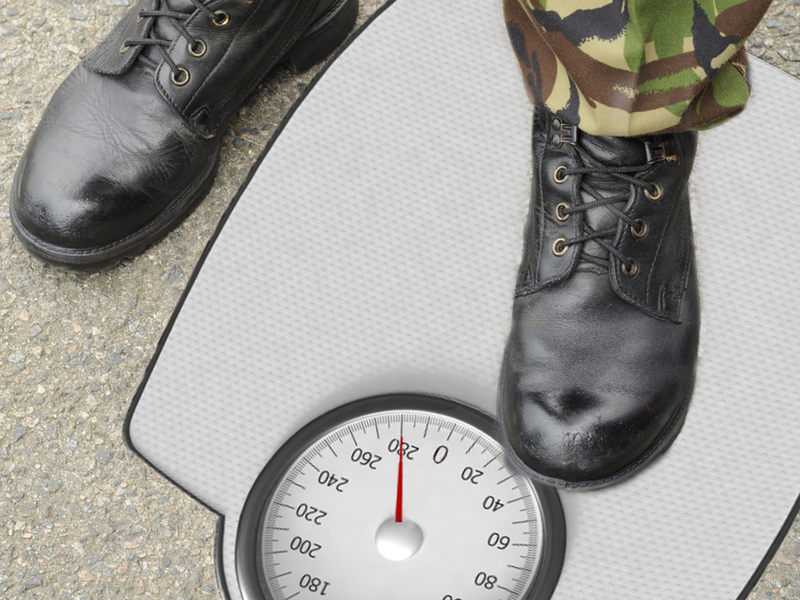 A 2008 Department of Defense survey found that 38 percent of people enrolled in the military health system were overweight or obese. If you'd like to see how the Army is putting its soldier-as-athlete model into action, you can download a free iPhone app called "Army Physical Readiness Training." It was developed by programmers at the U.S. Army Center of Excellence at Fort Gordon, Ga.